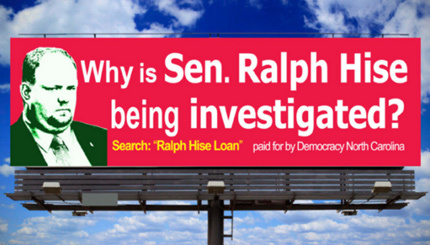 Five months after an initial complaint, the Bipartisan State Board of Elections & Ethics Enforcement is still investigating the campaign finance problems of State Sen. Ralph Hise (R-Mitchell) and refuses to make any material related to the investigation public under the Freedom of Information Act. “Records of investigations into potential violations of election laws are generally treated as confidential (N.C.G.S. § 132-1.4),” said Patrick Gannon, spokesman for the board, in a statement Wednesday. Jonathan Jones, director of the North Carolina Open Government Coalition and an instructor of media law, ethics and media writing at Elon University, said he disagrees with that assessment. “I don’t think the board meets the criteria of a ‘public law enforcement agency’ and certainly don’t think it’s the kind of body the General Assembly intended to cover [in the applicable statute],” Jones said this week. In declining to provide e-mails or other records, Gannon referenced a memo from the office of then-Attorney General Roy Cooper in 2013 on the confidentiality of criminal investigations conducted by the State Board. The memo takes too expansive a view of “law enforcement agency,” Jones said, but may give the board legal cover and force those seeking the public records to sue in order to obtain them. Hise loaned about $50,000 to the campaign, but was repaid about $60,000 according to the reports. Required information about campaign contributors – including employers and addresses – were missing from the reports. A failure to report more than $9,000 that nine political action committees reported making to his campaign over a four year period. A failure to provide itemized information on thousands of dollars in campaign disbursements. Hise, a four-term Senator and chair of the powerful Senate Select Committee on Elections and the Senate Redistricting Committee, has declined to comment on the investigation beyond a statement that his campaign is cooperating with the board. He has ignored repeated calls for him to recuse himself from the legislature’s ongoing efforts to draw new district voting lines and restructure state and local elections boards. Government watchdog organizations have criticized Hise for continuing to make policy that will affect the very bodies that are investigating him. “This is an obvious problem, since he has such a direct personal stake in who sits on the state board of election, which is investigating him, and how they operate” said Bob Hall, executive director of voting rights group Democracy North Carolina. Earlier this year, Democracy North Carolina looked further into Hise’s reports and concluded he has the worst disclosure record of any current lawmaker. The group has been spreading the word about what it calls Hall’s conflicts through a billboard campaign. They have rented one billboard in each of the three counties Hise represents – Madison, McDowell and Rutherford. Renting them wasn’t easy – Hall said several companies turned down the billboards because the billboard industry had sensitive business before the General Assembly as his group was trying to rent them.